Ultimate Hole 2: The 7th is a terrific par 4. Doglegging to the right, it requires a tee-shot played to a fairway framed by dunes and an approach into the prevailing wind to a well-protected green. Golfers may also experience the newer Skellig Bay Golf Club which is also closeby. "Where Champions Tread and Where Golfers Embrace Perfection"
A Golf Digest Ireland top 100 course are now offering some really great deals on green fees. Opened in April 2006 Skellig Bay Golf Club is fast maturing into one of Kerry’s must play courses. Located in Waterville the course could only be described as a headland layout as neither links or parkland best describe this stunning setting. Designed by the Irish American course designer Ron Kirby, formerly of Jack Nicklaus design and whose previous design work in Europe includes The Old Head of Kinsale, Mount Juliet and The London Club. Kirby is somewhat of a traditionalist when it comes to course design and is an advocate of visibility, fairness and enjoyment. As with all coastal courses there is little to protect the golfer from the sea breeze that is ever present, so mastering the knockdown shot and the bump and run will stand you in good stead here. Remember “in the breeze, swing with ease"”. Generous fairways but small, generally flat greens put an emphasis on club selection with the second shot, and if missed a good short game is required to save par. Your hosts will assist you in arranging green fees and tee times. Where Lough Currane meets Ballinskelligs Bay there are plenty of opportunities to try your hand at fishing. Strand fishing is a great challenge and can be organised through your hosts. Alternatively you may wish to do some deep sea fishing and boat trips can be arranged on site. Designated a UNESCO World Heritage Site in 1996 in recognition of its outstanding universal value the Skelligs are a short trip from Klondyke House and a boat trip to view the Rock can be arranged with your hosts. Located at the western edge of the European landmass, Skellig Michael was the chosen destination for a small group of ascetic monks who, in their pursuit of greater union with God, withdrew from civilisation to this remote and inaccessible place. Some time between the sixth and eight centuries, a monastery was founded on this precipitous rock giving rise to one of the most dramatic examples of the extremes of Christian monasticism. 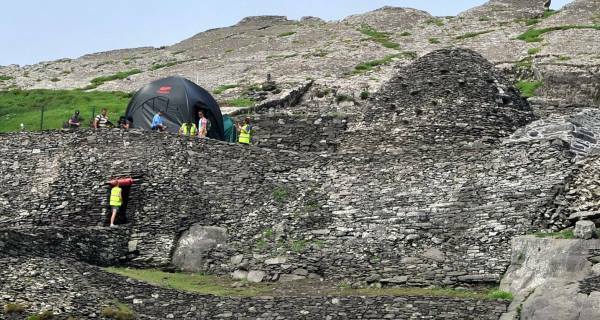 And it was here in July 2014 that an exclusion zone of two miles was set up around Skellig Micheal as J.J.Abrams filmed a portion of the new Star Wars Film 'The Force Awakens' which is due for release in December 2015.